Aventura is a medium-sized city located in the state of Florida. The city has a population of 37,515 people. In Aventura, there are 14,156 people per square mile, which is well above the national population density average. The majority of Aventura residents report their race to be White; this is followed by Black and Asian. Additionally, more than a quarter of the population of Aventura are of Hispanic or Latino origin, and 37% of the population also speak Spanish. The Aventura population appears to be aging at a faster rate than normal. The median age is currently 49, which is on the high side when compared to most other cities. If finding a family friendly city is important to you, look no further. With more than 83% of the population considered married and 71% with kids under the age of 18, Aventura could be considered a very suitable city for families. Without the right tools, moving to any new area can be very stressful and challenging. Living in Aventura, Florida could be a great experience for anyone who puts in the time to do the research required. The best areas in Aventura and in surrounding cities are easier to find when you are able to make informed decisions. Using data from amenities, crime, education, employment, housing, you will see a detailed breakdown of the most important information as well as comparisons to the Florida and national averages. With a livability score of 75/100, Aventura is ranked #4,902 in the United States and #364 in Florida. Clearly, Aventura is doing something right, as this score ranks well above the average of most cities. If we dig a little deeper into each category within the livability score, we see that Aventura has higher than average grades for the following: amenities (A+), weather (A), education (A+) and employment (B-). On a less positive note, Aventura does not have favorable scores for the following: crime (D), cost of living (F) and housing (F). If we take a look at the data, we can find out why. Based on the proximity of local amenities like grocery stores, restaurants, coffee shops, parks, librairies, etc., Aventura has received a higher than average score for its local amenities. If you’re planning on relocating and making this area your permanent home, it’s nice to know that there is an ample amount of amenities and things to do within walking distance or a short drive. Some of the notable things to do include: Aventura Mall, The Spa at Turnberry Isle, and Miami Movie Tours. Feeling a sense of safety in the area that you live in is a must for most people. Low crime rates can have a positive impact on things like home prices, home appreciation rates and the overall sense of community. Aventura has a violent crime rate of 158 crimes per 100,000 residents which is far lower than the national average. 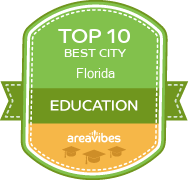 Knowing that the Aventura schools rank highly for test scores plays an important factor in deciding if this area is the right place to live. The average school test scores are 87%, which is far higher than the national average. Certain items on your wish list like shopping, restaurants, nightlife and proximity to public transportation are all important factors to search for. Having said that, perhaps the most important metric to consider when contemplating a move to Aventura is real estate affordability. The median home price for Aventura homes is $310,300, which is 86% higher than the Florida average. If we take a closer look at the affordability of homes in Aventura, we’ll see that the home price to income ratio is 5.6, which is 64.7% higher than the Florida average. Knowing if your home will appreciate on a long term or even a short term basis should be factored into your decision making. An increase in your home’s value can be a good way to generate tax-free equity that can create long term financial security. In the past year, appreciation rates for homes in the Aventura area were -0.3% and 5 year appreciation rates were 4.2%. How Do You Rate The Livability In Aventura? Florida is one of the most fun places on earth period. The sunshine state has enough smiles and fun to last me for a life time. My favorite place in this state is Aventura. This place has truly been a trove of fun and laughs for me. Aventura has many different hotels and attractions that will make anyone to stay forever. The Hamptons and Marriott both are there and have wonderful facilities. The beach of course, like the majority of Florida is a big destination. The Selection of food and the festivities in the area are fun and numerous and often have seasonal conditions. The number of different places to shop are staggering and the outlet stores in this city hold many popular brands. Aventura is a fun place for family. The amount of fun we had here was unbelievable and the nightclubs are very exciting. This city is a hub for fun for all ages and they have created an environment that is very intoxicating and fun to be in. Source: The Aventura, FL data and statistics displayed above are derived from the 2016 United States Census Bureau American Community Survey (ACS).